The Creature Feature aims to introduce you to an inhabitant of the Indian Ocean every month. Many of these creatures live not far offshore from some of our favourite beachside destinations. Let’s find out a little more about them. Butterflyfish are a group of colourful tropical marine fish of the family Chaetodontidae. Reminiscent of their butterfly namesake, a majority of the species within this family display bright colourations and striking patterns. Many also have “eyespots” on their sides and dark bands across their eyes, similar to the disruptive patterns seen on many butterfly wings. Additionally, they have uninterrupted dorsal fins and rounded or truncated tail fins which contribute to a distinctive oval or disk-shaped structure. In the same way that butterflies are conspicuous in a field of flowers, a diver on a tropical reef will easily spot these colourful fish flitting about amidst the coral and reef rubble. Butterflyfish, generally ranging from 12 to 24 cm in length, are diurnal and spend most of their daylight hours foraging along the reef, usually in waters less than 20 metres deep. At night they hide in crevices within rocks and coral and many of them display a markedly different nocturnal colouration. The beauty of natural design and evolution is quite evident in butterflyfish. Typically classified as corallivores (feeding on coral polyps), these fish use their keen eyesight to seek out exposed polyps, as well as tiny worms and other marine invertebrates. Since hunting such small, concealed prey requires a great deal of precision, butterflyfish have developed permanently puckered mouths that allow them to pick food out of tight spaces. The Longnose Butterflyfish (Forcipiger flavissimus) and the Big Longnose Butterflyfish (Forcipiger longirostris) are classic examples of butterflyfish with overtly elongated snouts. 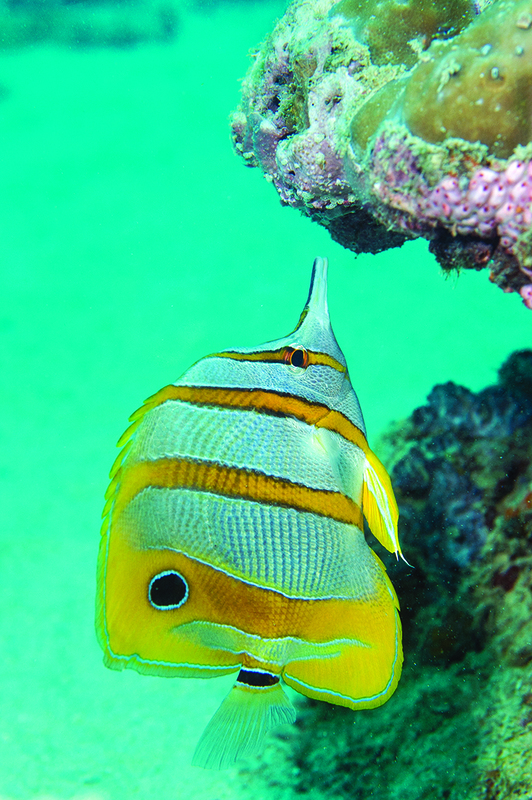 In general, most of the fish in the Chaetodontidae family seem like they are always looking to be kissed. This Long-Beaked Coralfish (Chelmon rostratus) hovers underneath a coral overhang foraging for food with its long snout. The species displays an ocellated spot towards the rear of the dorsal fin. Found along coastal inner reefs and in estuarine waters, often in turbid conditions. When observing butterflyfish, and their closely related angelfish cousins, it is difficult not to wonder about the evolution of their striking colours and patterns. Why are they as brightly coloured as they are? Why do most of them have bands of black masking their eyes? Why do some have a distinctive black spot on their flanks or towards the base of their tail fin while others have a thin crosshatch of black or grey stripes across their bodies? The answers to these questions aren’t fully understood, and there probably isn’t one reason, but a few contributing factors that determine the colouration of reef fish. There are, however, two broad theories within the scientific community explaining why these fish are so colourful. Alfred Russel Wallace, renowned British naturalist, geographer and explorer and a contemporary of Charles Darwin, suggested that the bright colours of reef fish actually help them hide in an equally colourful and mottled environment. While the colours and patterns of the fish might allow them to blend into the confusing colours of their background coral reef, the black spots on their bodies and the black bands over their eyes may help to break up their “fish shape” and conceal features that make them more easily recognisable to predators. To understand this better we would first have to understand how reef fish and their predators actually perceive light and colour. The second theory, developed by Austrian zoologist and ethologist Konrad Lorenz in the mid-20th century, suggests that fish are conspicuously coloured to help them identify their own species in the crowded reef environment, where there is direct competition not only between species but also between members of the same species. Despite their intricate colours and patterns, no two butterflyfish of the same species are exactly alike, and Lorenz believes that colours and patterns may allow for individual recognition within a group. Many butterflyfish, especially the corallivores, form pairs and inhabit a “home territory” which they guard against other encroaching corallivores. Whatever the reason for their incredible colouration, and whether in pairs on the reef or in groups feeding in mid-water, butterflyfish with their perpetual “kiss me” expressions are a pleasure to watch on a dive. Cover Photo: White Collar Butterflyfish (Chaetodon collare) are most often found in pairs but sometimes form large aggregations. It is a pleasure to watch when swimming in a group, with their patterned sides creating mesmerising movements.